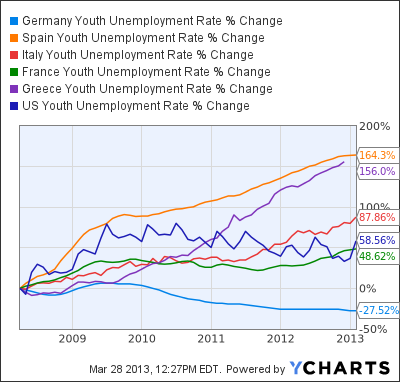 Mish's Global Economic Trend Analysis: Youth Unemployment Rates: US, Germany, Italy, Spain, France, Greece; Where to From Here? 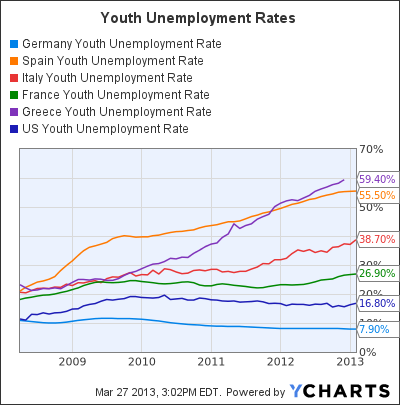 Youth Unemployment Rates: US, Germany, Italy, Spain, France, Greece; Where to From Here? 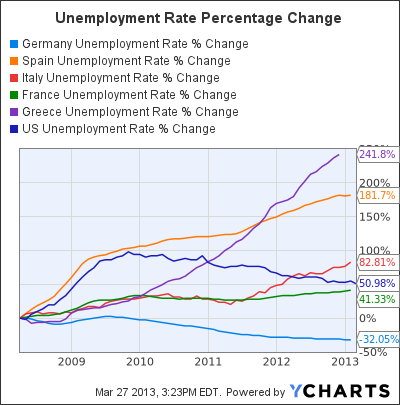 Here are some unemployment charts I put together via Ycharts. Spain and Greece have youth unemployment over 50%. Germany, at 7.9%, has the only youth unemployment rate under 10%. US has second-best 16.8%, nothing to brag about except in relative terms. Once again, notice the tight clustering at the start of the recession vs. the huge spreads today. 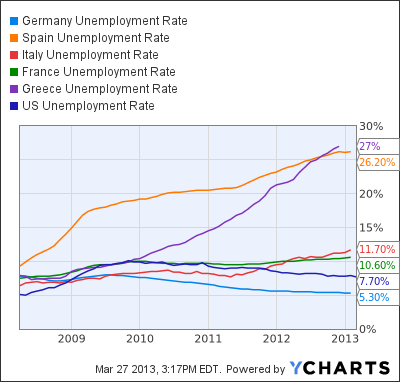 As with youth unemployment, Spain and Greece lead the pack with overall unemployment rates above 25%. In percentage terms, Germany is the only country with falling youth unemployment. US youth unemployment is up 58.56% in five years. In percentage terms, Germany is the only country with falling overall unemployment in the last five years. German unemployment has fallen by 32.05% in five years, while US unemployment is up 50.98% in the same time frame. Since late 2009 US unemployment has dropped, but much of that is a mirage based on people dropping out of the labor force at a staggering rate, with many going on disability. For the disability connection please see Unwilling to Work; 25% in Hale County AL Collect Disability, 14 Million Nationwide; A Simple Solution. The global "recovery" is over, even though economists in general refuse to make note. So don't expect the US to be immune from rising unemployment either, no matter how much Bernanke floods the system with QE.